Automate preventive maintenance tasks. Enable operators to create maintenance requests. Quickly assign work orders to technicians. Manage equipment, machines, vehicles, and other assets from anywhere with the UpKeep app. This software is easy to set up and update! Manage your assets and team from your office or on the go. Manage every asset from a unified platform. Also create one-time or recurring work orders for injection machines, forklifts, conveyor belts, transport vehicles, and anything in between. Eliminate unnecessary trips to the stockroom. 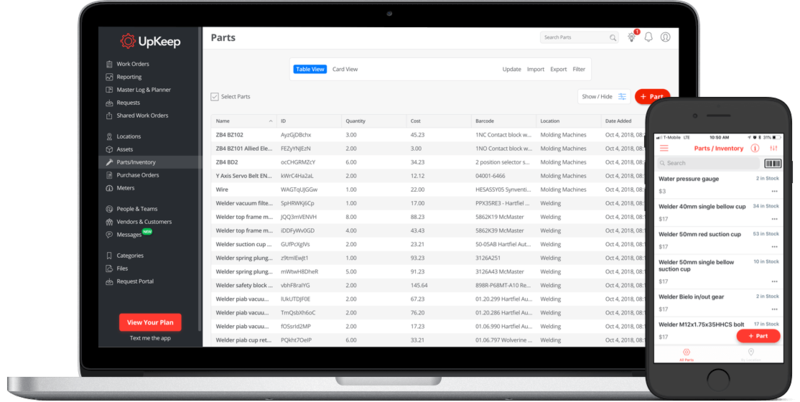 Manage inventory for replacement parts, liquids, and accessories from your desktop or mobile device. Parts are automatically deducted from inventory when used in a work order and automatically added when a purchase order is fulfilled. Assign work orders to your maintenance team in seconds and view open and pending work orders for each technician on the mobile app. Also, with UpKeep’s advanced reporting, you can export any technician’s full work order history as a PDF for review. Make everyone an active part of your maintenance team. When an equipment operator, driver, or machinist noticies a problem, let them create a maintenance request — from the smartphone in their pocket or the kiosk on the factory floor. Then approve it and assign it to the right tech. When an asset fails, have operators mark it as Inactive. When it’s fixed, have technicians mark it as Active. Then run reports on this. Get visual reports and export PDF reports for asset uptime and work order history by tech, asset, or location. Set up workflows so when you approve/create a work order it’s automatically assigned to the right technician. View a complete asset life cycle, costs of repair, and time spent on repairs for each asset. Create new work orders based on incoming maintenance requests and quickly assign them to the right technician. Molding machines, incinerators, panel benders, pipe benders, grain cleaners, forklifts, you name it. Use UpKeep’s machine and equipment maintenance software to schedule preventive maintenance tasks and track maintenance time, parts costs, and downtime for each asset. Manage your fleet of garbage trucks, pickup trucks, or tractor trailers. UpKeep lets operators and mechanics log mileage with the “Meters” feature and create maintenance requests from an easy-to-use app. UpKeep also integrates with Titan GPS for real-time vehicle tracking. For manufacturing companies, the facility is the greatest asset. It’s where all the work gets done. With UpKeep’s asset management software, you can also manage your facility. 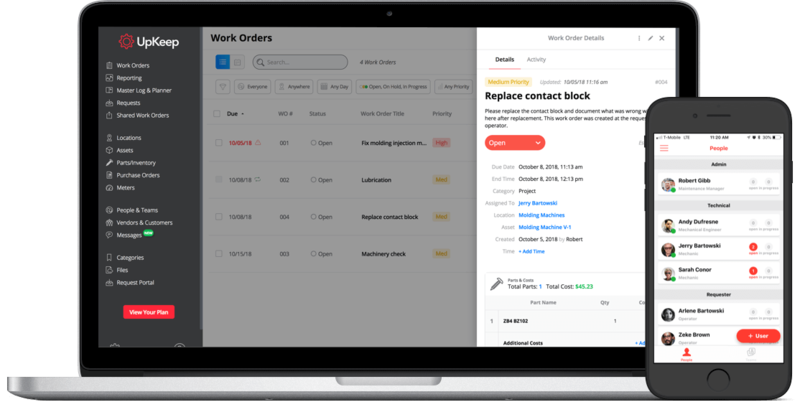 Create recurring work orders for light checks, floor cleaning, and safety walkthroughs. 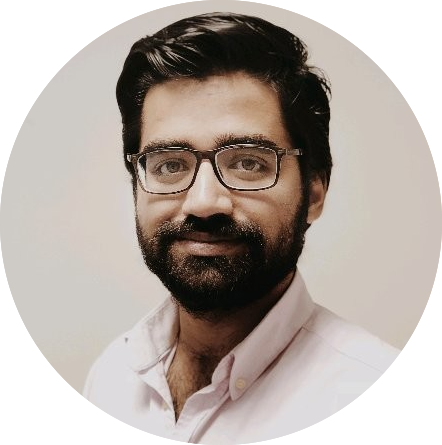 To remain a leader in the consumer goods space, Unilever’s factory engineering and maintenance manager switched from spreadsheets to UpKeep’s CMMS to better manage machines, equipment, work orders, technicians, and inventory at 12 manufacturing facilities. The CMMS should present a clean view of which assets have work orders assigned to them that are closed, in progress, on hold, and open. It should also let you download a history of work orders and costs for each asset for specific date ranges. To encourage maintenance best practices across the entire company, the maintenance manager, technician, and operator should be able to easily use the equipment maintenance app with different access levels. This way, repairs get done quicker and schedule compliance increases. To simplify preventive maintenance efforts, you should be able to create recurring work orders. And when a request is created that’s outside the maintenance schedule, the respective work order should be assigned to the right technician automatically based on the repair type. Put preventive maintenance on auto-pilot and track asset downtime and costs from one easy-to-use app.